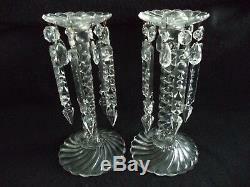 Offered is this lovely PAIR of Fostoria crystal candlesticks or candleholders in a swirl pattern called Queen Anne. 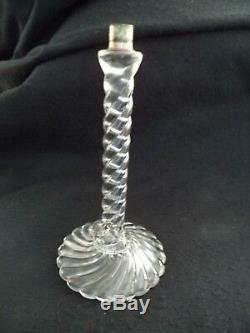 The candleholders feature a swirl base and barley-twist stem. They are topped by boboches with crystal teardrops and dangling prisms, five of each for each candlestick. The light reflected by the prisms has the effect of crystal lusters. The candleholders stand 11.75 inches tall (30 cm). They are in good used condition. 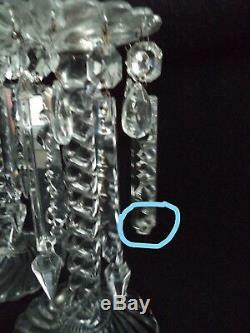 One dangling prism has lost its point, as you can see in the last photo. Otherwise, no chips, cracks or other damage. The item will be insured. 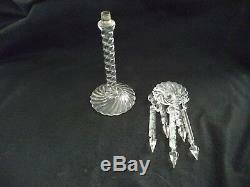 The item "Fostoria crystal 2 Queen Anne candlesticks lusters swirl 1920s dangler prisms" is in sale since Monday, September 10, 2018. 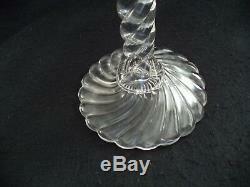 This item is in the category "Pottery & Glass\Glass\Glassware\Elegant\Fostoria\Other Fostoria Glassware". The seller is "micknsue" and is located in Norman, Oklahoma.